Hello, lovelies! Did everyone have a wonderful weekend? This morning, I had originally planned to blog about my latest creation - a white eyelet version of Simplicity 1873 - but complications have arisen. Namely, the sleeves are an inch too small, because I was brilliant and neglected to alter the pattern piece as planned. Luckily, all blogging hope is not lost. The lovely Garnet, of Ruby Satin, drew my attention to a very exciting fashion happening: Ulyana Sergeenko has a new Spring/Summer collection! Let's be honest: we'd all much rather look at her breathtaking creations than mine. The entire collection can be viewed at Vogue Russia, the source of these images. Which is your favorite? I'm rather torn between the emerald velvet dress and the blue floral circle skirt. Friends, this is an exciting week. Not, as one would think, because of Valentine's Day. Sure, I love flowers and hearts as much as the next girl, but there are more exciting things. Like...vintage patterns! That's right. I, Mary Danielson, finally made a vintage pattern. Well, mostly. The bodice is vintage, anyway. (We'll get to that.) Why is this such a big deal? 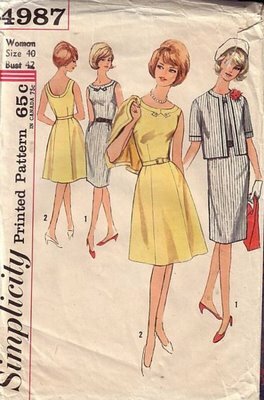 Many sewing bloggers use vintage patterns. Between Etsy and estate sales, they're not exactly hard to find. And found them I have. Y'all, I have a ridiculous amount of vintage patterns, but...I've been too afraid to do more than caress their lovely envelopes or unfold their library-scented pages. What if I damaged one while sewing? What if I made one up, only to have it be horribly unflattering? All my vintage sewing dreams would be crushed! They were not. My first foray into vintage patterns was a success! Hooray! Does anyone have any confetti to throw? So, what finally made me take the plunge? This week's Sew Weekly challenge and some really fabulous fabric. 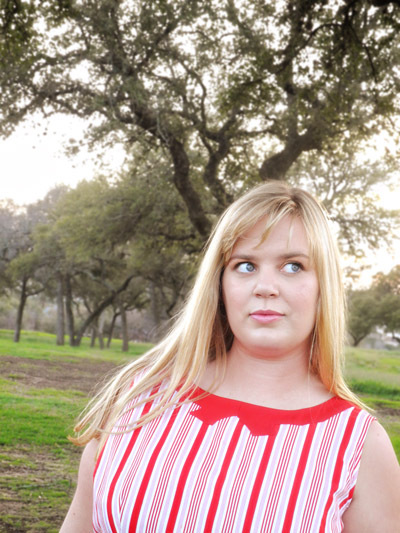 Since this week is technically focused on Valentine's Day, the theme was red and I had the perfect yardage - this red striped cotton from Gorgeous Fabrics. It's been hanging out in my stash since last summer, when I snapped up it and its black striped sister fabric. How could I resist its pinstripe and bold stripe mix? So interesting! So...striped! It was a perfect match for Simplicity 4987, a 1963 lovely with a six-gored skirt, bow collar detail, and matching jacket. Of course, I ended up making it with a dirndl skirt and no jacket. Let's be honest. 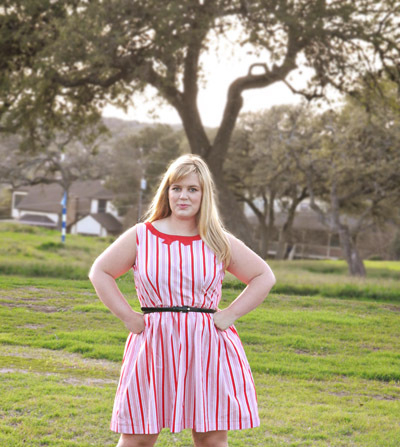 A striped six-gored skirt? Can you imagine a first vintage project with more headaches? I am not a sewing masochist, friends. So, I switched to the nice, easy, no-matching-required dirndl. For the bodice, however, I kept it original. 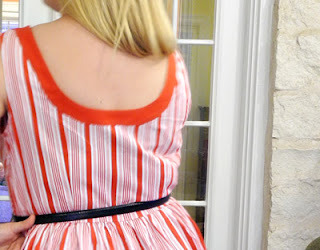 In order to keep the stripes from overwhelming my face, I used a red twill for the collar. Not only does it have the lovely bow detail at the front, but it made the finishing of this dress so simple. Used just like bias tape, it is top-stitched to the bodice, circling both the front and the low scooped back. Isn't it lovely? I can easily imagine it in white on a blue dress, as a lovely Alice-inspired detail. Scoop! And horrible, blurred picture! Backs are hard to photograph, yo. As for other construction details, everything was rather straight forward. It only took me four episodes of Downton Abbey to finish the whole dress, from cutting out to hemming. The armscyes are finished with red bias tape and all the inside seams are overlocked like crazy. Instead of the prescribed lapped side zipper, I took the easy way and used an invisible zip. It was all ready for a night out on Valentine's Day...you know, all romantic-like, eating hamburgers and chocolate pie. 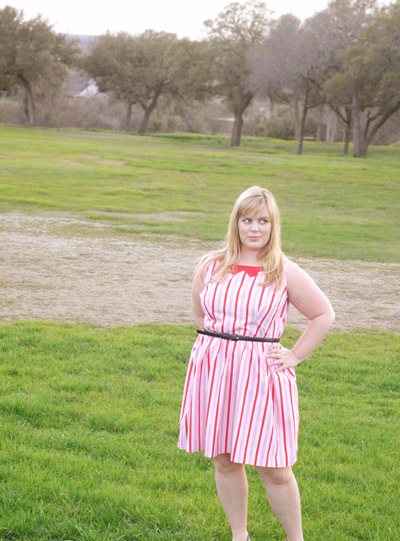 I like to think my peppermint striped dress classed things up, naturally. The lovely neckline! After all, that is why I bought this pattern in the first place. I'm so glad it turned out as beautifully as on the pattern envelope! The fabric! I've been waiting to use this fabric and I'm so glad it was on this pattern. It really needed that coordinating bit of red, to make it work perfectly. Switched from a six-gored skirt to a dirndl, because I am easily daunted by pattern matching. Switched from a lapped zipper to an invisible zip, because I am lazy. Omitted arm facings, in exchange for bias tape, because I do so hate facings. Keep the original skirt. I'm dying to make this in a solid color, to really take advantage of the six-gore skirt. It seems to have such a lovely bell skirt quality to it on the envelope. Precisely four episodes of Downton Abbey. What, you don't measure your time in Lady Mary/Matthew Crawley scenes? Well, then. Three and a half hours. There's something about the stripes that makes me pose like a superhero. I swear, 98% of pictures from this shoot involve me putting my hands on my hips, as if I'm posing for a statue. Super Sewist! Seam rip, rip, ripping away! Yikes.